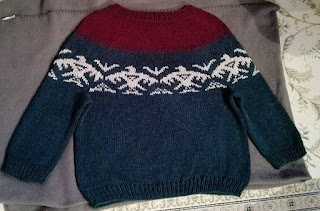 My daughter asked me to to knit her a traditional Norwegian jumper, known as Mariusgenser, Marius sweater/jumper. I've been meaning to try stranded knitting for a while, so I thought I'd use up a load of yarn I'd bought on offer and give it a go. 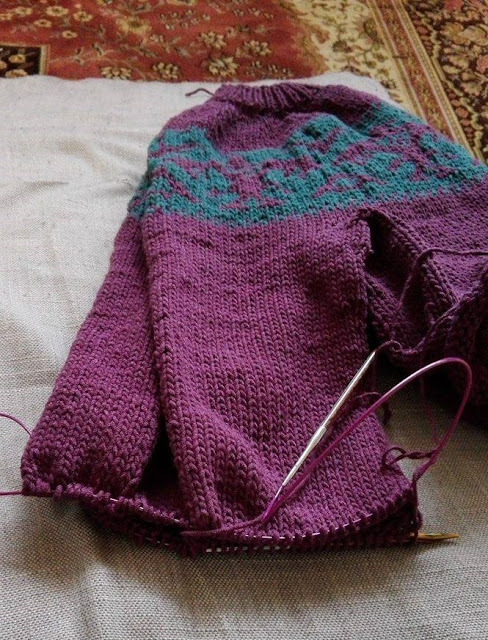 I'd also had a few conversations with friends about trying stranded knitting and the attitude I've had towards knitting larger garments, like sweaters and cardigans. For some reason, I felt like it was unaffordable, even though I would spend any amount of money on several batches of sock yarn! So, this was the perfect opportunity. I had the yarn already, and I'd always believed that this Fair Isle style of sweater wouldn't suit me. 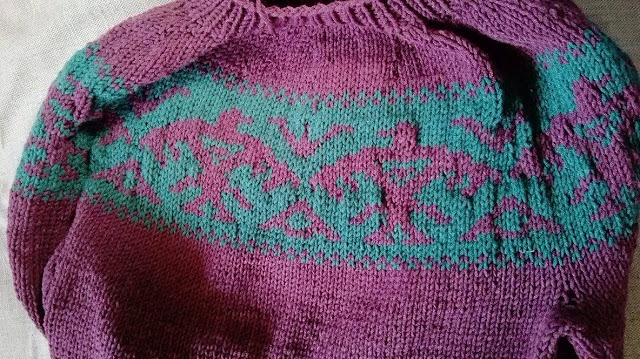 so knitting it for my daughter was ideal. 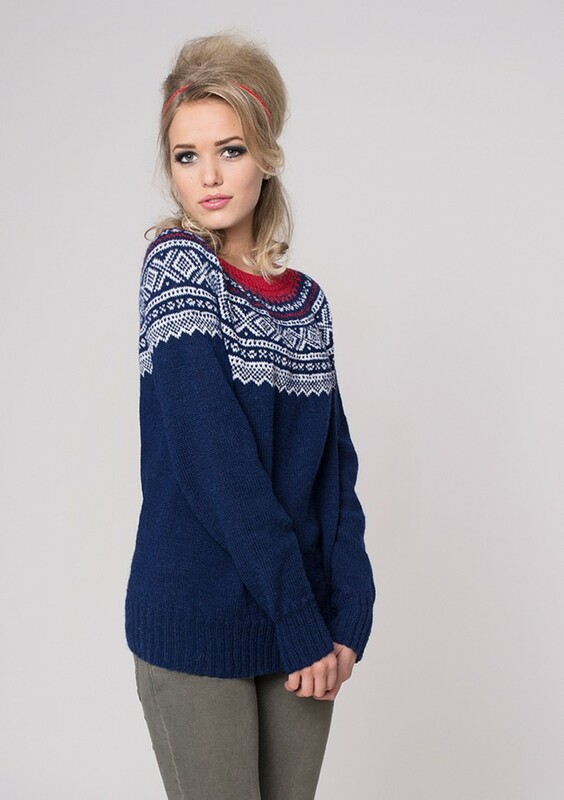 The most common variant of this traditional jumper is red white and blue with dropped shoulders, which I think is quite unflattering if you're a woman with slightly broad shoulders. There are many variations of colour and style - here's a link to my Mariusgenser Pinterest board. 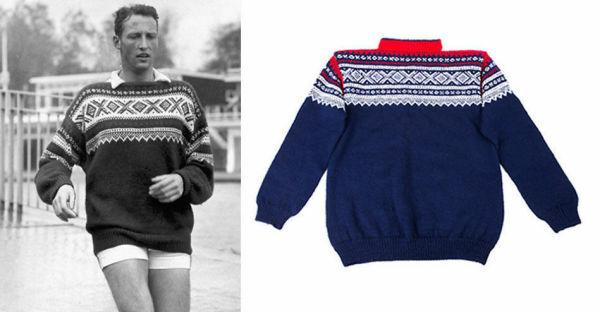 King Harald of Norway, aged 23 wearing a traditional Mariusgenser. 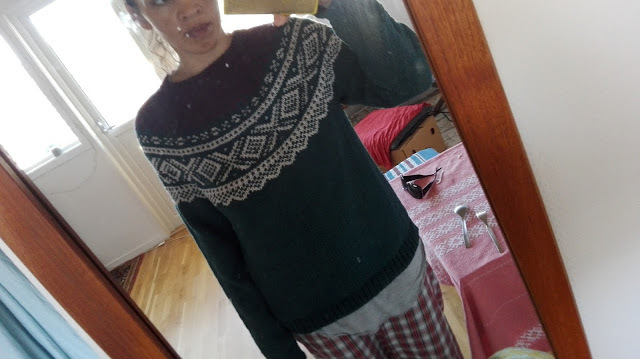 I wanted to knit a jumper with a round yoke, which is also something I've never done before. 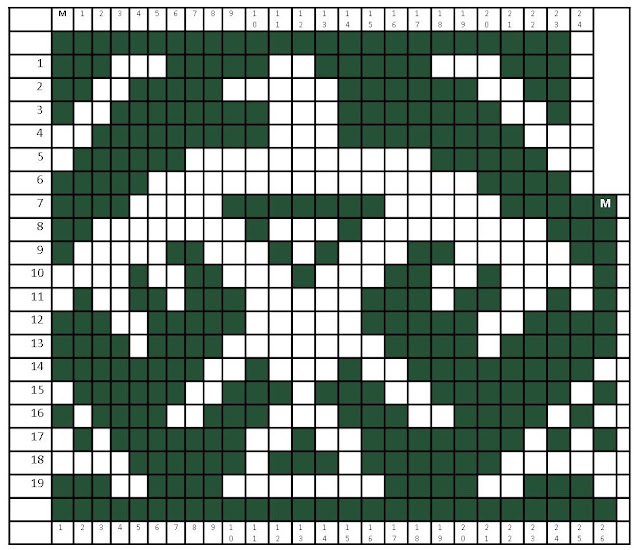 I searched for a free pattern for gauge and stitch count and made my own chart. Then just went ahead and started knitting. The first attempt wasn't a complete success, so I made notes and started again. 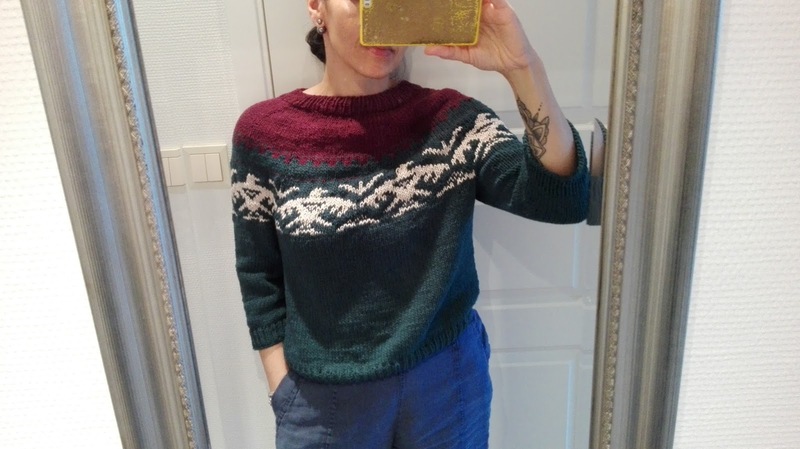 Here's the finished jumper. The colours aren't traditional, but, as I said I had all this dark green bamboo blended yarn to use. We went back to the store to buy the contrast colours. It took a while but eventually settled on these, a dark red and an off white. Even though this was for my daughter, I really liked it and decided straight away that I wanted one for myself. I didn't really want the Marius pattern, so I thought I'd try something else. So, I used the same colours and made this Ojibwe eagle chart. 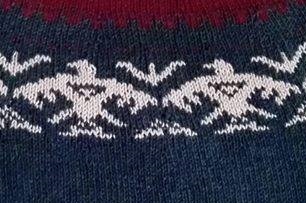 These eagles all face the same direction. I'm really happy with the finished result, but I realised it would have been better if the eagles were facing each other at the centre front and back. Also, the neck shape wasn't great. So, I started another jumper using the above Ojibwe double eagle pattern and also borrowed a short row technique for shaping the neck from this Drops pattern. I bought more of the dark red, because I didn't have too muvh time to think about it, and made a subtler contrast by leaving out the off white. Also, on all projects, I knitted the sleeves two at a time using magic loop. Highly recommended. I've made notes of the whole process and I'll publish all the information when it's done. 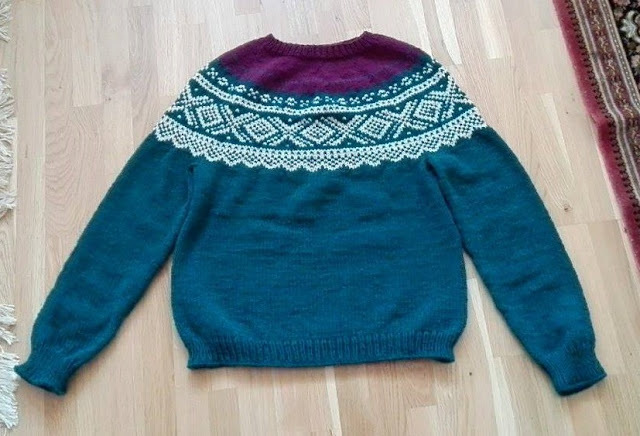 I might even attempt to write out the full pattern!